CES is a beast. A monster that cannot be tamed. One of the biggest trade shows on the planet, Consumer Electronics Show hits Las Vegas this week. And I mean hits like Holyfield, with 182,000 attendees, 2.5 million square feet of exhibition space, and 24 categories from drones to sleeptech to smart cities to driverless cars. Of course, last year my driverless car demo didn’t … drive. Perhaps it will this year. 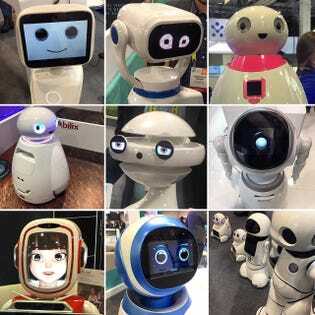 Here are the 13 things that I — and some of the technology leaders I asked — are expecting at this year’s CES. Yet another first-world-problem-solving startup has pitched me on luggage that follows me. I’m guessing it works find until another bald white dude walks past, in which case my underwear and electronics will end up in someone else’s hotel room. 2017 was the year of the drone at CES, but there will still be plenty in Las Vegas in 2019 too. But now the drones are getting more diverse and sophisticated. One that I’ll be demoing is an underwater drone. I hope it can find its way home by itself if I lose track of it. At CES you invariably find some Chinese company that you’ve never heard of but sells billions of dollars worth of electronic gadgets for every conceivable and many inconceivable needs. Smart home is an increasingly hot category and CES 2019 will definitely up the ante here. I’ll be playing ping pong with a robot this year, like last, but this year it will beat me (maybe). And with 27% more robotics exhibitors this year versus 2018, there will be more to see. Spoiler alert: they will be cool, they will be expensive, and they will not quite fulfill the promises their makers make. However, they do portend a future in which our beer fetches itself, Roombas actually work, dishes wash, toilets clean, and electronic pre-glass-slipper Cinderella’s do all the grunt work we care not to. That includes making bread. I’ll be checking out BreadBot, which can make 10 loaves per hour for your restaurant or store. Why have a razor when you can have a smart razor? A trash can when you can have a smart trash can? Everything that brands can possibly put AI in, they will. After all, you can buy a toilet with Alexa built in now. As the toilet mentioned above evidences, everything must now come with Alexa or Google Assistant included. That’s excellent in many ways, but not for all: my wife refuses to have an Amazon Echo in our living room. 5G is a faster way for our phones to talk to the internet, and it will change everything, some pundits declare. I’m not certain, since I still am old-fashioned enough to watch my YouTube at 1X speed, instead of the up to double speed Google enables. However, when we move into the augmented reality universe mediated by smart glasses, the extra speed will certainly help load the ads clogging our visual field faster. It turns out that at current stages of development, 3D printers won’t be in every house. But the tech is getting better, says designer and developer Murray McDonald. CES 2019 should have quite a few new 3D printers. Battery tech is critical not just for the devices in our pockets but the devices that take us to and from home and work and play. We’ll see better battery tech, but I’m also getting pitched on environmental energy harvesting technology that can power battery-less Internet of Things infrastructure … a game-changer for off-grid smart city tech. Augmented reality is increasingly looking like the default operating system of the future for humans, mainly delivered via smart glasses. They’re perhaps five years away from anyone other than early adopters, but I’ve tried some interesting systems from Vuzix and Epson, and we’ll see more innovation here. A lot of people can’t stand CES due to the crush and busy-ness and vast scope, so as TechCrunch writer John Biggs told me, the other big thing you’ll see at CES is people leaving early. However, I will not be one of them. CES may be big. It may be tiring. It may be noisy. And it may be crazy. But it’s also a ton of fun for anyone who likes gadgets, electronics, or the future.